Backyard decks can enhance any yard in the Collinsville, Illinois area, providing a perfect place to relax or entertain friends. And when you need a company to install your new deck, turn to Chesley Fence & Deck. 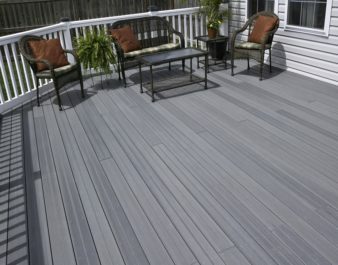 We offer expert installation and several decking options to choose from, so you are sure to find the option that best suits your budget requirements and style preference. While all of our decking options are top-notch, more often than not, our Tamko Envision® PVC coated composite decking is recommended most by our installers for backyard decks because it is backed by a 20-year manufacturer warranty that covers staining, fading, and discoloration. But no matter what decking option you choose, you can rest assured that it will be installed with expert precision and in any configuration you desire. To learn more about the backyard decks we install in yards all over the Collinsville, IL area, contact Chesley Fence & Deck today.